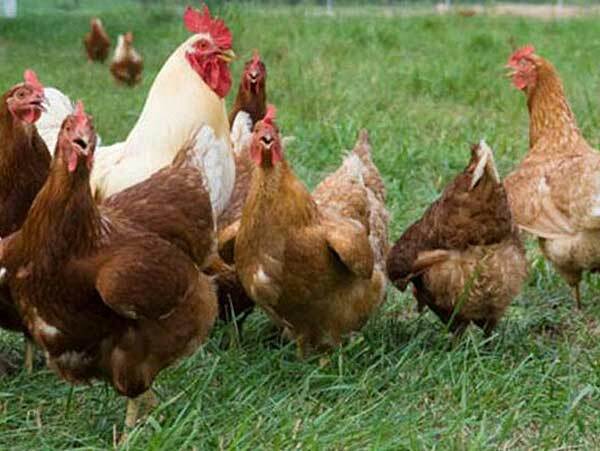 Chickens are kept for the eggs they produce and for meat. 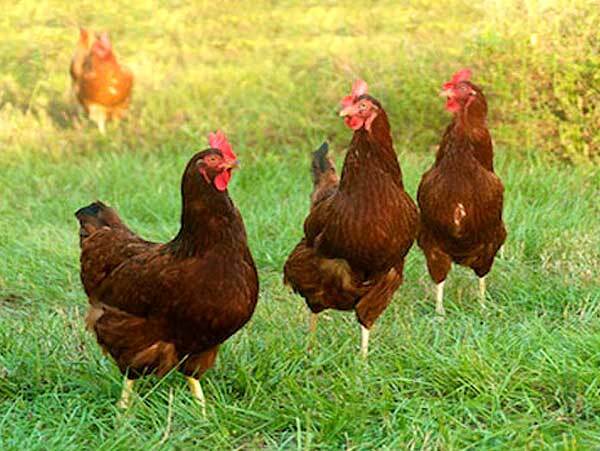 A hen, a female chicken, will lay about 6 eggs a week. 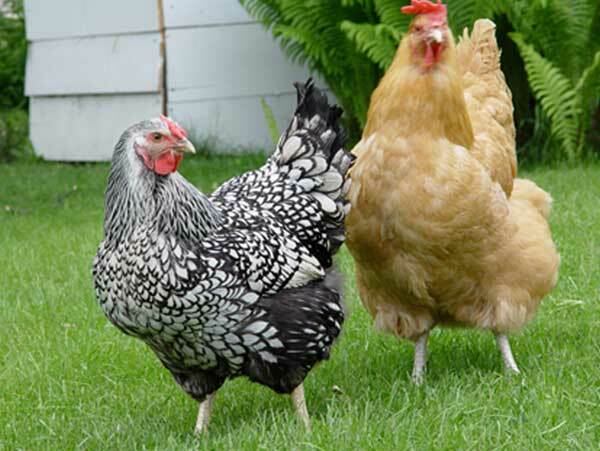 Did you know that the chicken is the closest living relative of Tyrannosaurus Rex? Scientists studying material from a skeleton of the big dinosaur, 68 million years old, found it was similar to the modern day chicken. A female chicken is a hen. What is a male chicken called? What's the red flap on the top of a chicken's head called? 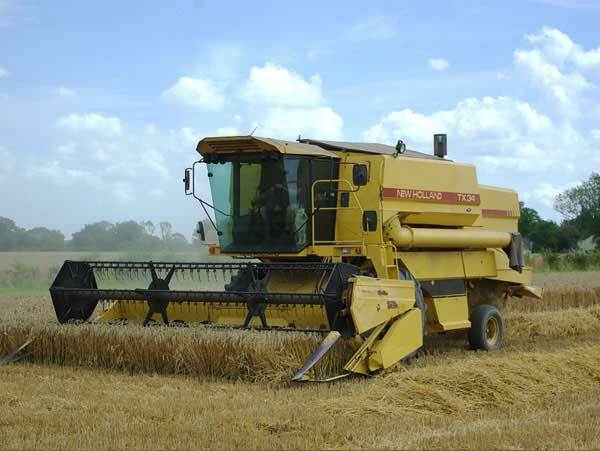 The combine harvester must be got ready to cut and collect the crops of wheat, barley and oats when they are ripe. The huge machine has been standing in the shed since last summer so the farmer checks it is in good working order. The cutting blades are sharpened and all the moving parts of the machine are greased. The machine must be ready to work for the long hours it takes to bring in the harvest. 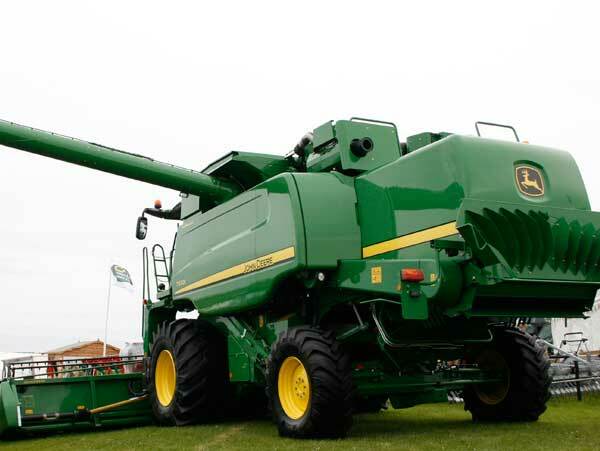 Do you know how a combine harvester works? This diagram shows you. Which of these crops would you harvest with a combine? 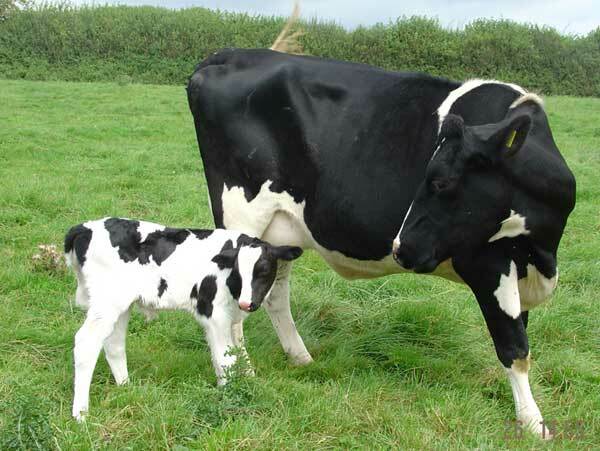 The black and white Friesian-Holstein is the most common breed of dairy cow on Cornish farms. She can produce 25 to 30 litres of milk a day. 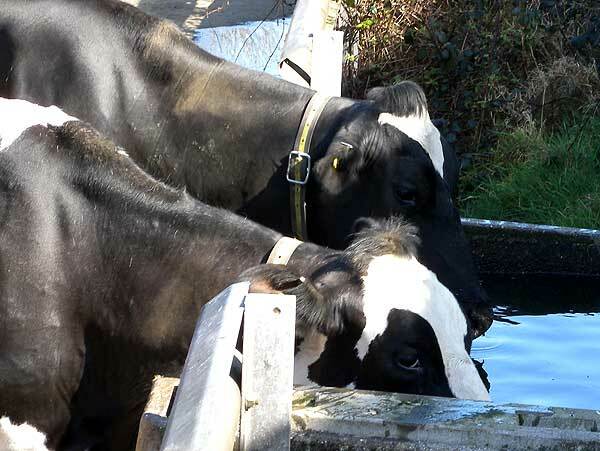 A dairy cow drinks a large quantity of water each day. It can be as much as 100 litres. That’s enough to take a bath in! How much do you think a cow like this eats? She spends about 6 hours eating every day and can eat 80-100kgs of grass. Grass is not easy to digest, even when you have four stomachs as cows have. After they have eaten their fill, cows lie down and chew the cud. 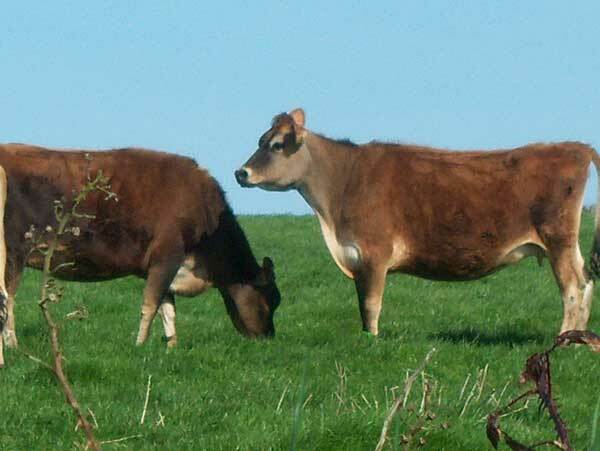 Jersey and Guernsey cows were once the most popular breeds on Cornish dairy farms. The Jersey cows are small and give rich creamy milk. 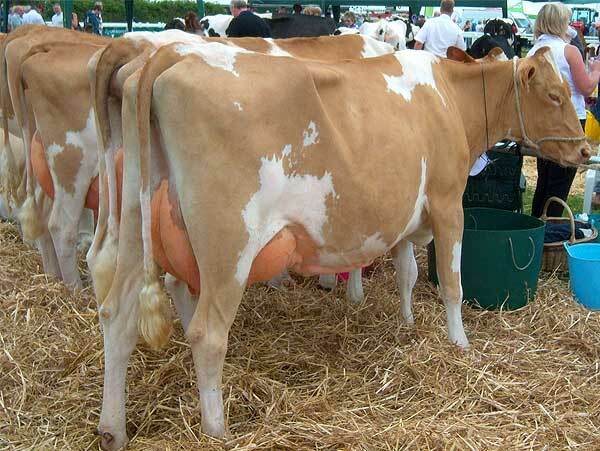 The Guernsey cow gives creamy milk too and is bigger than the Jersey. They are usually brown and white. 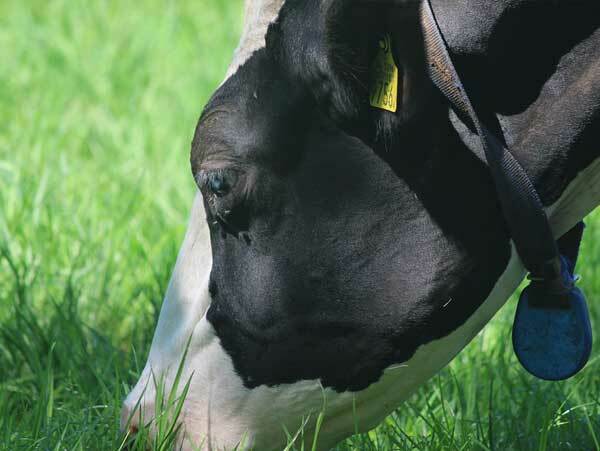 Chewing the cud – grass that has been chewed and swallowed is bought back up into the mouth and chewed again. This helps the cow to digest the grass. 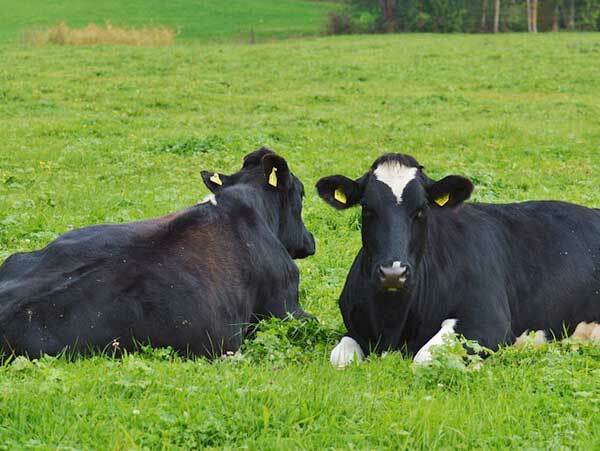 How many litres of milk can a Friesian cow produce each day? As the combine moves forward, the header gathers the crop into the machine. 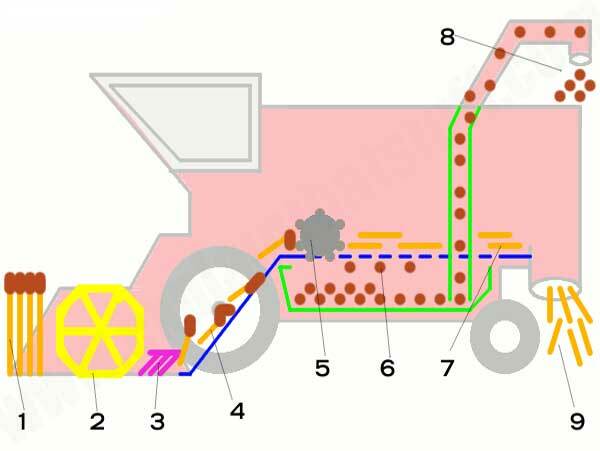 Different headers are used for harvesting different crops. 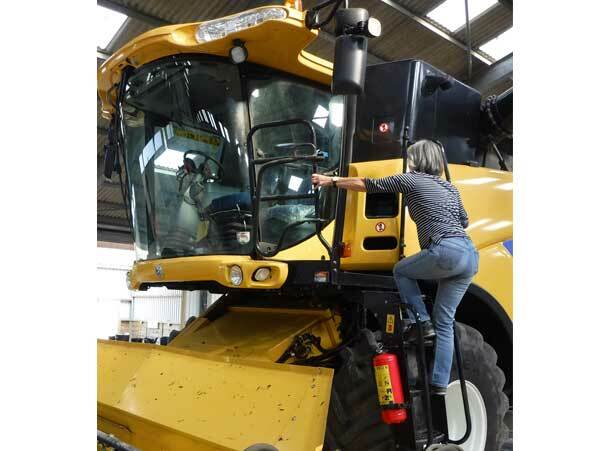 The header can be removed and towed behind the harvester lengthwise when moving the combine on the road. A slowly rotating wheel called the reel pushes the crops down towards the cutter. The reel has horizontal bars called bats and vertical teeth or tines to grip the plant stalks. The cutter bar runs the entire length of the header underneath the reel. Its teeth open and close repeatedly to cut off the crops at their base, a bit like a giant electric hedge cutter sweeping along at ground level. Behind the cutter bar, the cut crops travel up a conveyor to the processing mechanism inside the main part of the combine. A threshing drum beats the cut crop to break and shake the grains away from their stalks. The grains fall through sieves into a collecting tank below. When the grain tank is full, a tractor and trailer pulls alongside the combine. The grain is carried up from the tank by an elevator and shoots out of the side pipe into the trailer. The straw tumbles from the shute at the back of the machine. The straw is either baled, then used for fuel and animal bedding, or chopped and ploughed back into the soil.